Ideally students will have achieved a minimum Grade 3 or above in either English and Mathematics at GCSE. However, if these grade are not achieved, course entry will be discussed on an individual basis. 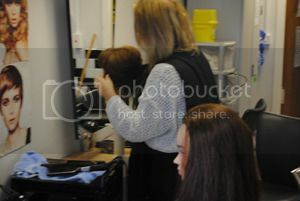 Learning will take place in an onsite salon, through consultation with real clients using professional brand Eve Taylor and through a two-week block work placement in a commercial setting. In parallel, students will develop their communciation and customer service skills, their awareness of environmental sustainability and their commercial skills; all of which are valued highly by employers. Problem solving, team working and research skills will also be developed. Assessment will be based on 50% portfolio evidence, 30% external examination and 30% client based consultation and practical assessment of all mandatory skills. You will also gain an additional qualification in Semi-permanent lash extensions, MyLash lift eye treatment and Gel nails. On successful completion of this course you can enter employment as an apprentice beauty therapist or progression onto a specialised Level 3 Beauty Therapy pre- employment course which could lead into fashion, television or cruise ship work. A tutorial programme is mandatory and supports the student throughout their studies with guidance and individual learning plans put into action.